The Hellenic National Opera has been puttin on first-ever operatic rendition of Christomanos novel. 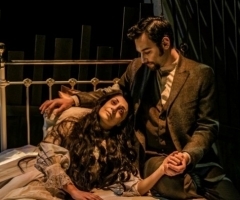 One of the most important novels in Greek literature, "The Wax Doll" by Konstantinos Christomanos, is to be adapted as an opera that will be performed by the Greek National Opera on its 'Alternative Stage' at the Stavros Niarchos Foundation Cultural Center (SNFCC), with 8 performances starting on March 7th, 2019. Widely credited with "changing the direction of Greek literature in the early 20th Century," Christomanos' masterpiece will be brought to life on stage in an opera composed by Tasos Rosopoulos and directed by Simos Kakalas, who has woven gothic elements, film images and realistic masks and memories to recreate an Athens from bygone eras. First published as a book in 1911 (the year that the author died), "The Wax Doll" has been reprinted many times and was also made into a film by Michalis Glitsos in 1916, as well as a theater play, television series and graphic novel. This is the first time the story has been rendered as an opera. Kakalas said that he had wanted to avoid nostalgia for the "lost Athens" by focusing on darker things, on action that could be occurring at any location.